Mammalian cells contain a pool of iron that is not strongly bound to proteins, which can be detected with fluorescent chelating probes. 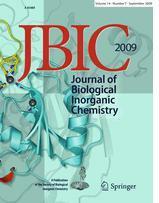 The cellular ligands of this biologically important ‘‘chelatable’’, ‘‘labile’’ or ‘‘transit’’ iron are not known. Proposed ligands are problematic, because they are saturated by magnesium under cellular conditions and/or because they are not ‘‘safe’’, i.e. they allow iron to catalyse hydroxyl radical formation. Among small cellular molecules, certain inositol phosphates (InsPs) excel at complexing Fe3? in such a ‘‘safe’’ manner in vitro. However, we previously calculated that the most abundant InsP, inositol hexakisphosphate, cannot interact with Fe3? in the presence of cellular concentrations of Mg2?. In this work, we study the metal complexation behaviour of inositol 1,2,3-trisphosphate [Ins(1,2,3)P3], a cellular constituent of unknown function and the simplest InsP to display high-affinity, ‘‘safe’’, iron complexation. We report thermodynamic constants for the interaction of Ins(1,2,3)P3 with Na?, K?, Mg2?, Ca2?, Cu2?, Fe2? and Fe3?. Our calculations indicate that Ins(1,2,3)P3 can be expected to complex all available Fe3? in a quantitative, 1:1 reaction, both in cytosol/nucleus and in acidic compartments, in which an important labile iron subpool is thought to exist. In addition, we calculate that the fluorescent iron probe calcein would strip Fe3? from Ins(1,2,3)P3 under cellular conditions, and hence labile iron detected using this probe may include iron bound to Ins(1,2,3)P3. Therefore Ins(1,2,3)P3 is the first viable proposal for a transit iron ligand. Veiga, Nicolas, “Chelatable iron pool : inositol 1,2,3-trisphosphate fulfils the conditions required to be a safe cellular iron ligand,” RIQUIM - Repositorio Institucional de la Facultad de Química - UdelaR, accessed April 22, 2019, http://riquim.fq.edu.uy/items/show/1565.